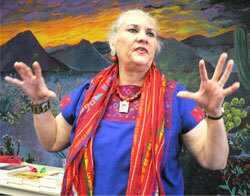 Denise Chávez is one of the leading Chicana playwrights and novelists of the US Southwest. Her books include The Last of the Menu Girls, Face of an Angel, Loving Pedro Infante and A Taco Testimony: Meditations on Family, Food and Culture. Throughout her writing she emphasizes the need for comunidad, or community, and that is exactly what she creates in spades at the Cultural Center de Mesilla that she runs with her husband, Daniel Zolinsky. A stone’s throw from where Billy the Kid was once jailed, CCM is a vibrant, eclectic place where you can buy books, new and old, find wonderful LPs which have been donated to the center, attend workshops as diverse as learning about Nahuatl and Mayan teachings to creating a papel picado. There is also a children’s corner and a freezer where you can buy delicious handmade Mexican ice cream. It was at the Cultural Center de Mesilla that my novel, The Double Happiness Company, received its US launch this summer. To view a short video of the celebrations, click here. The Cultural Center de Mesilla and Denise will be featured in PBS’s “The American Experience”, in a new documentary about Billy the Kid’s life and his relationship to the Southwest and Hispano New Mexico. It will be aired nationally on 10 January. For more information, click here. Denise is also the Founder and Director of the Border Book Festival, the longest running literary festival in the American Southwest. This year's title is “The Shamanic Journey” (La Jornada Chámanica) which will take place from 20 - 22 April in Mesilla, New Mexico, featuring healers from Mexico to Africa.